These are the last couple outfits I made with some of my Fantasy Faire goodies. Again, it ends soon, so make sure you pick up these limited edition items, and see what else your favorite sellers are offering! Luminary released this limited edition color for Relay for Life, and it's perfect for medieval role play. Although it's covered by the Saiken fur wrap, there's lacing on the torso of the dress that gives it a cute detail, and the texture is subtle and nice. Some of Luminary's items are difficult to fit, and the alpha on this is no exception where the neckline of the dress is. If you have an AO with a lot of movement, you'll notice your skin protruding through the mesh, which is a bit frustrating at times. The jewelry is Lazuri's new group gift, the Perllina necklace and earrings. Lazuri makes some of my favorite jewelry, and is easy to customize, and the group is well worth the price to join with frequent group gifts. My rings are from Maxi Gossamer, my other favorite jewelry designer. You might recognize my hair from Violent Seduction for Enchantment, and it's only 100L at her store. The sandals are from Candy Doll, from a previous round of Kustom 9. This dress is one of the two that The White Armory has for their RFL specials.I haven't bought much from TWA since mesh was introduce, although their flexi dresses were always beautiful, it seemed like they have lagged behind on the creation of mesh. As of now I don't believe that any of their items are original mesh, but the texturing makes it a very worthwhile purchase. The silver armor shown is new from Alchemy and is available at We <3 RP this month. The pale green modesty shirt is from Lua's. 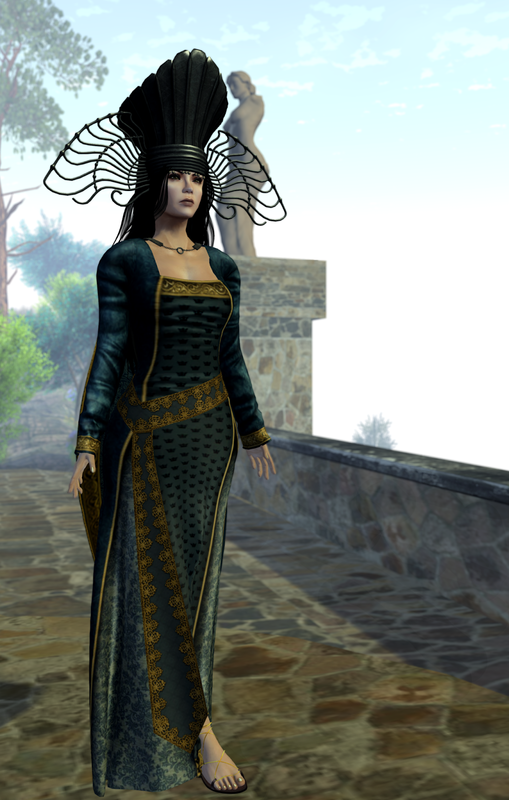 This is the final TWA dress, again, another RFL special edition color and will only be available to buy during the Fantasy Faire event. The High Council hat (which I thought was just the coolest thing) is not a Relay for Life item, but one by 22769 and is showcased at the Fantasy Faire, I put the old Vent group gift from Lelutka under it. The necklace is by Cute Poison, and for the life of me, I can not remember if I also picked that up at Fantasy Faire. The sandals are made by Pure Poison.